82 Would God have left the meaning of the world to your interpretation? If He had, it has no meaning. For it cannot be that meaning changes constantly and yet is true. The Holy Spirit looks upon the world as with one purpose, changelessly established. And no situation can affect its aim but must be in accord with it. For only if its aim could change with every situation could each one be open to interpretation which is different every time you think of it. You add an element into the script you write for every minute in the day, and all that happens now means something else. You take away another element, and every meaning shifts accordingly. 83 What do your scripts reflect except your plans for what the day should be? And thus you judge disaster and success, advance, retreat, and gain and loss. These judgments all are made according to the roles the script assigns. The fact they have no meaning in themselves is demonstrated by the ease with which these labels change with other judgments made on different aspects of experience. And then in looking back you think you see another meaning in what went before. What have you really done except to show there was no meaning there? But you assigned a meaning in the light of goals that change, with every meaning shifting as they change. 84 Only a constant purpose can endow events with stable meaning. But it must accord one meaning to them all. If they are given different meanings, it must be that they reflect but different purposes. And this is all the meaning that they have. Can this be meaning? Can confusion be what meaning means? Perception cannot be in constant flux and make allowance for stability of meaning anywhere. Fear is a judgment never justified. Its presence has no meaning but to show you wrote a fearful script and are afraid accordingly. But not because the thing you fear has fearful meaning in itself. 85 A common purpose is the only means whereby perception can be stabilized and one interpretation given to the world and all experiences here. In this shared purpose is one judgment shared by everyone and everything you see. You do not have to judge, for you have learned one meaning has been given everything, and you are glad to see it everywhere. It cannot change because you would perceive it everywhere, unchanged by circumstance. And so you offer it to all events, and let them offer you stability. 86 Escape from judgment simply lies in this—all things have but one purpose which you share with all the world. And nothing in the world can be opposed to it, for it belongs to everything as it belongs to you. In single purpose is the end of all ideas of sacrifice, which must assume a different purpose for the one who gains and him who loses. There could be no thought of sacrifice apart from this idea. And it is this idea of different goals which makes perception shift and meaning change. In one united goal does this become impossible, for your agreement makes interpretation stabilize and last. 87 How can communication really be established while the symbols which are used mean different things? The Holy Spirit's goal gives one interpretation, meaningful to you and to your brother. Thus can you communicate with him and he with you. In symbols which you both can understand, the sacrifice of meaning is undone. All sacrifice entails the loss of your ability to see relationships among events. And looked at separately, they have no meaning. For there is no light by which they can be seen and understood. They have no purpose. And what they are for cannot be seen. In any thought of loss, there is no meaning. No one has agreed with you on what it means. It is a part of a distorted script which cannot be interpreted with meaning. It must be forever unintelligible. This is not communication. Your dark dreams are but the senseless, isolated scripts you write in sleep. Look not to separate dreams for meaning. Only dreams of pardon can be shared. They mean the same to both of you. 88 Do not interpret out of solitude, for what you see means nothing. It will shift in what it stands for, and you will believe the world is an uncertain place in which you walk in danger and uncertainty. It is but your interpretations which are lacking in stability, for they are not in line with what you really are. This is a state so seemingly unsafe that fear must rise. Do not continue thus, my brothers. We have one Interpreter. And through His use of symbols are we joined so that they mean the same to all of us. Our common language lets us speak to all our brothers and to understand with them forgiveness has been given to us all, and thus we can communicate again. I gladly make the "sacrifice" of fear. 1 Here is the only "sacrifice" You ask of Your beloved Son—You ask him to give up all suffering, all sense of loss and sadness, all anxiety and doubt and freely let Your Love come streaming in to his awareness, healing him of pain and giving him Your own eternal joy. Such is the "sacrifice" You ask of me, and one I gladly make, the only "cost" of restoration of Your memory to me for the salvation of the world. 2 And as we pay the debt we owe to truth—a debt which merely is the letting-go of self-deceptions and of images we worshipped falsely—truth returns to us in wholeness and in joy. We are deceived no longer. Love has now returned to our awareness. And we are at peace again, for fear has gone and only love remains. What do we give up when we release guilt and fear? Jesus says that we give up suffering, sadness, a sense of loss, anxiety, and doubt. Is that a sacrifice? Would we not willingly want to release the pain and suffering that we experience in our lives? Yes, we certainly would if we recognized that guilt and fear are at the core of all our dreams. Until we do, we are deceived. We think that we are giving up something valuable. We are giving up being right about who we are and what the world is. What stops us is that we want to be in control. We like to be in charge of our lives, even at the cost of our peace and happiness. We have not understood what makes us free "nor where to look to find it." (W.321.1.1) We think we know what we need to make us feel safe and happy. Jesus tells us that fear is at the core of all our dreams in this world. When we start to recognize that this is the case, we realize that it is all a mistake, but to get to this point, we must look at the thought system that has given rise to the separation. We must look at all the beliefs and values we hold and the self-concepts we cling to. We must start to realize that we have bought into a story that is not true. This process of undoing is not readily achieved because it means letting go of our attachment to everything in this world, including our own identity. It is just an image that contains a name with which we identify and a body we think is ourselves, separate from others, limited, needy, constantly seeking, constantly afraid, and thus highly defended. How willing are we to recognize that holding onto judgments, opinions, values, our specialness, our defenses, and even our anger brings us pain? Perhaps to some extent we do. We judge some of our thoughts as "bad" and hurtful, but we also believe that we have a lot of "good" thoughts that we value highly. We think that we are right about our opinions, and we defend what we think. We justify our perspectives and give evidence for our positions, but anything based on a desire for separateness, specialness, exclusion, or aloneness is not of God. In our identification with our bodies and personalities, our lives are ruled by fear. Until we become aware of who we really are and remember that we have been given everything, there will be fear. Fear obscures the love that is there all the time. Why are we so frightened of abundance, of success, of joy, of greatness, or of intimacy? We are afraid because we feel unworthy of love. We judge ourselves as not deserving. Our belief in guilt and punishment takes precedence, and our biggest fear is the loss of the self that we have accepted as what we are. We have come to accept our lives of loss, failure, suffering, scarcity, and finally death. "How lovely do the laws of fear make death appear." (T.23.II.15.7) (ACIM OE T.23.III.33) For all of us, there is an attraction to death, lurking behind our fears that makes death seem like a lovely option because we associate it with peace. Fear keeps us from being playful, intimate, joyful, open, and loving. We hide behind the images that we have made, which we think keep us safe. We keep our secrets hidden lest we be judged. We hide "shameful" thoughts, believing they are the truth about us. We keep ourselves small and afraid of moving to a new level. With each step we take to bring the darkness into the light, our confidence is renewed that there truly is nothing to fear. As the internal conflict in our minds is brought to healing, we get external evidence in our lives of more peace. It is not because things change in the world, but we change our mind about them. We no longer engage in the conflict. We look out from a place of greater peace, and the world witnesses that peace back to us. That is what forgiveness is all about. That is what brings more flow and greater giftedness to our lives. This Lesson can really make us wonder at the insanity of the ego. How can we want to hold onto suffering? And yet we do. We choose to hold onto our sense of loss, sadness, anxieties, worries, and any number of forms of fear. Why? For one thing, we think that it is thrust upon us, and there is nothing we can do about it. We believe that we are the victims of what others have done to us. For another, we believe that we deserve to suffer for what we perceive we have done. And finally, we find something of value in it. Otherwise, we would let it go because we have the power to do so. "Look upon it, open-eyed, and you will nevermore believe that you are at the mercy of things beyond you, forces you cannot control, and thoughts that come to you against your will." (T.19.IV.D.7.4) (ACIM OE T.19.V.d.96) Everything we hold onto is in our own mind. A dear friend recently wrote to me about the beliefs he was holding. He said he felt he was beyond forgiveness, beyond redemption, and deserved eternal damnation. He got in touch with his belief that he had taken from God and had murdered Him. Then the belief came to his awareness that the fall from grace and the separation was totally his fault, and with that came great shame and unworthiness, which awakened the self-hatred and compounded the guilt tenfold and thus brought even more self-hatred. Our thoughts torture us, and in giving over these thoughts, we find the peace within. In accepting the healing into our minds, we can know our innocence. There is nothing outside our minds. In his case, he was grieving a perceived loss---a shattered dream---and lived in the trap of those thoughts. In that process, he could not accept his innocence, but, instead, he was projecting his beliefs in loss, grief, scarcity, and death onto the character in his dream, who seemed to be the cause of how he was feeling. All that is called for is a willingness to claim our innocence. When we hold onto our story, our agendas, and our indulgences, we are not deciding for Heaven. With willingness, we take the hand of Jesus and together we go into the darkness and bring our dark and self-condemning thoughts to the light of truth. We need help. "You can never control the effects of fear yourself, because you made fear, and you believe in what you made." (T.1.VI.4.2) (ACIM OE T.1.I.93) Thus, our part is not to do the healing ourselves because the ego will never undo itself. Our part is simply to be willing to look at our thoughts that are fear-based and bring them to the truth. The rest is in the hands of the Holy Spirit. It seems like a no-brainer to "gladly make the 'sacrifice' of fear," (W.323) which allows God's Love to "come streaming in to his awareness." (W.323.1) However, resistance is strong. We think God asks sacrifice of us. We think we must pay off our debt to Him. We are told in the Bible that God asked His only Son, Jesus, to be sacrificed and to die a horrible death. The image in our minds is that we too must pay off a debt to him. We do that all the time in our relationships, don't we? We think that when we have done something hurtful, we must atone to the one we hurt. We need to find a way to make up for what we did. In the same way, we think that we must do something to atone with God to restore the relationship, but here Jesus says that this is not the case. We have been dreaming, and nothing real has happened. We can simply awaken to the truth of who we are, and to do that, he only asks one thing of us. He only asks that we give up our fear and self- condemnation and accept our innocence. When we do so, we sacrifice nothing that we would want to keep. Do you notice how you hold onto your suffering, sadness, anxiety, worries, doubt thoughts, and any number of fear thoughts? We are the maker of these thoughts, and therefore only we can choose to release them. Holding onto them blocks the love that God wants to have come streaming into our awareness; although, holding onto these painful, distressing thoughts maintains that we are right about the way we see a situation. To maintain our individuality and specialness, we have been willing to pay the price of suffering. It truly makes no sense to keep our fear thoughts when all we are doing is keeping love out. All God asks of us is to give Him our suffering. Is that a sacrifice? We can only benefit ourselves and thus the world. Our entire journey in this world is about the undoing of fear. Then we can accept our innocence, which is an essential part of the Atonement. Where does this fear come from? The Course tells us, "All fear is ultimately reducible to the basic misperception that you have the ability to usurp the power of God." 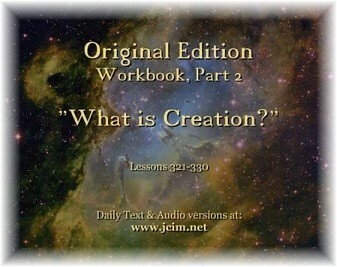 (T.2.I.4.1) (ACIM OE T.2.I.15) That is the foundation of it all. Of course, it is not something of which we are consciously aware. We have chosen to forget. We fear that we have changed our very nature, disrupted Heaven, and made a self in opposition to God. It is only a fearful dream. Now, we have a choice to make as to how quickly we are ready to release our fearful thoughts and our stories. In other words, how motivated are we? "If a light is suddenly turned on while someone is dreaming a fearful dream, he may initially interpret the light itself as part of his dream and be afraid of it." (T.2.1.4.6) (ACIM OE T.2.I.15) The truth about ourselves is that we are only love and nothing else. Anything else we think we are is only a dream and an illusion about ourselves. "The fear of God is fear of life, and not of death." (T.23.IV.1.2) (ACIM OE T.23.V.47) It is fear of love. This Lesson is powerful and can be applied to any thoughts taking precedence in our mind today. Look at the thoughts you are obsessing about. What is at the core of those thoughts? In other words, what is the content behind them? Is it fear, unworthiness, hate, or frustration? Bring this content to light so that it can be dissolved. It takes great willingness and lots of discipline and practice to do this work, but the only "cost" to you is the "sacrifice" of fear. Notice any resistance to giving up these thoughts and recognize that the resistance is about justifying why you should feel the way you do; it is the story running in your mind. This need not be. We can make a choice today, with every fear thought that crosses our minds, to accept the Atonement (Correction), and thus, the love, peace, and joy that is within can return to our awareness.